Read. We have so many books in our house. There is something for everyone to read. Or, borrow a book from the library, they have large ebook selections now as well. Draw a picture. Crayons, colored pencils, or markers. If your children are old enough they can create a game of Pictionary of it. Or if you have Bath Crayons , bath time can be a great time to draw a picture. Paint. Anything can be a paint surface, anything can be painted, you don’t have to have paper. We have painted a number of different things: tin foil, ice, windows. You know what I just said about crayons in the tub? Make some bath paint and have at it! Play dough is always a hit here. I always have some or the ingredients to make more. I have even made play dough on a wood stove during a power outage. Kitchen science experiments. Baking soda, baking powder and vinegar can delight most school-agers and younger for a little while. See what else in the kitchen will cause a reaction. Dance party! This is something I can, and often do, randomly. Turn the stereo up and move. We also have Nickelodeon Dance for our Wii, and it entertains my girls for an hour or longer. Burns off energy and gives them something to do. Have a nap. So, this one might really be a wish, and I should probably say watch a movie instead, but a Momma can wish right? Put a movie on, pop some popcorn, pull out sleeping bags or pile pillows high to make a comfy movie sit. A bath in its self is a favorite thing to to do for my kids, anytime of the day. I’ve also put them in the bath before because they wouldn’t stop fighting. They stopped fast! 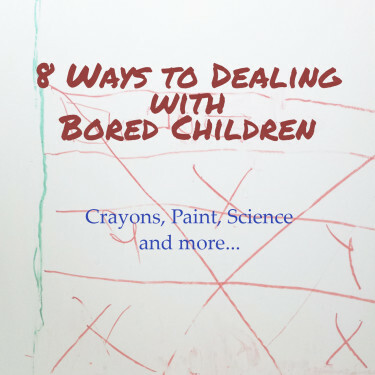 Do you entertain your children when they come whining that they are bored? What is your go to plan for boredom? We also liked to dance to American Bandstand. Now I’m really talking a long time ago! LOL. I used to dance to mom and dad’s tape collection. I do remember them having a lot of records and an old record player. The nap is always my favorite! Bored children will be the death of me…I despise those words!